Results: do you care about 360-degree cameras? 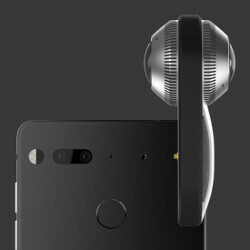 One of the Essential Phone's special features is its module port — you've got a magnetic connector on the back, which will accept Essential accessories with a click. And, at launch, we've got two of those — a 360-degree camera and a charging dock. About that camera — the company definitely makes a big deal out of it. It's portable, it doesn't need a battery as it is powered by the phone, it's supposed to be high-quality, and will only set you back an extra $50 if you order it with the Phone right now. Mr. Rubin and co. talk the camera up enthusiastically. And while we agree that it looks like an awesome little gadget, we are still unsure whether users care about 360-degree footage all that much. We thought we'd ask you — our readers — how essential you think a 360-degree camera is. Here's how the votes tallied up! Are you interested in a 360-degree camera? I have one / planning to buy one! Might buy one if it's affordable, but don't care much about them. Nope. I have one / planning to buy one! Might buy one if it's affordable, but don't care much about them. No one truly cares. Even Vloggers have clearly stated that 99% of the time even the audience doesn't find it exciting after the 1st few seconds as they focus on the subject of the video. If it came as a standard on all smartphones. Then this poll wouldn't​ be asking that question. I think this new Essential smartphone is taking the right steps. Especially since their 360 camera is only $50 more. That is really inexpensive. Actually it's worth $200 dollars on its own, it's just $50 when preordered with the Essential phone. 360 camera will be prevalent in surveillance when the image quality improves. Whether it will catch on with consumers will depend on how good the image quality and how affordable. If its cheap and good why wouldn't i take a 360 selfie during my holiday travel. Its far more interesting to show to friends. You could also innocently capture the hottie that wouldn't have with a conventional camera. Don't speak for the rest of us bud...lots of us can see the coolness factor in something like this - and it beats panorama pics any day. Vloggers simply haven't found the right way to use it. The ones that do will find their niche. In Japan there are net shows that record in 360', one had the panel participants sit around a coffee table instead of of straight table . Can I assume that the majority of those who took this poll belong to a particular OEM that hasn't released a 360 degree camera yet? When this OEM makes one of their own the loyal users will be all over this concept. There will be a time when 360 camera tech will be embedded in phones. This is hot ! !